PHILADELPHIA -- Few places distill the buzzy energy of collegiate life quite like Woodland Walk in West Philadelphia. Cutting diagonally through the campuses of both Drexel University and the University of Pennsylvania, the leafy, red-brick lane teems with wide-eyed freshmen and tweed-clad professors whizzing by on bikes. For Hospitality 3 hotelier Paul McGowan, 56, the area was a shoo-in for the location of his latest opening, The Study at University City, a 212-room hotel perched at the busy corner of 33rd and Chestnut streets. 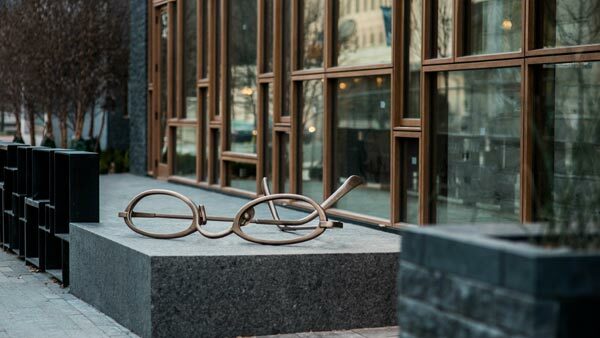 Ten stories tall, with a slate brick and split-face granite exterior that glitters in the sun, the hotel -- which opened in January -- is the second installment of McGowan's Study Hotel series. The first Study Hotel, The Study at Yale, opened in 2008 in New Haven, Connecticut, and set the blueprint for the concept: boutique, campus-affiliated accommodations, customized to reflect a school's unique personality and catering to sophisticated, well-to-do parents and guests who want to tap into the life of the mind during their stay. The Yale location has a New-England-meets-Manhattan aesthetic, with blue-and-white seersucker robes in each room's closet and shelves lined with tomes from New York's legendary Strand Bookstore. At the new Philadelphia hotel, display cases with sliding glass drawers showcase parts of collections from three local museums: the University of Pennsylvania Museum of Archaeology and Anthropology, the Academy of Natural Sciences and the National Museum of American Jewish History. Old-school, analog touches abound: There are standing desks hung with newspapers, and writing desks where guests can jot off handwritten postcards and letters, which the hotel will post free of charge. The Philly location also gave McGowan, who for years developed the W hotel brand as an executive at Starwood, an opportunity to draw on his latest design obsession: Nordic architecture. Working with architecture firm Digsau, McGowan created a first-floor lobby that's airy and clean, its long modern lines softened by light wood finishes, muted natural colors and cozy wingback leather chairs. In the restaurant adjoining the lobby, called CO-OP, chef Craig Russell (an alum of beloved Philly BYOB Will) cooks up shareable American plates in a space inspired by a magazine photo McGowan saw of a Norwegian bait shop. Upstairs, rooms (which start at about $240) are designed in minimalist luxury style and feature unique surrealist oil paintings commissioned by McGowan through local gallery Carr d'Artistes and painted by Italian artist Carlo Trevisan. If McGowan seems to have an especially hands-on approach, it's because the idea for Study Hotels evolved from personal experience. While touring universities with his college-bound daughter in 2003, he found himself staying at "some not-so-nice hotel accommodations as we toured different schools." He suspected there was a market for campus hotels that were neither utilitarian nor anonymously upscale, but imbued with the spirit of the school and a passion for intellectual pursuits. "When I started to look at Yale very closely, I could see this amazing institution, people coming from all over the world, well-educated, well-heeled. There was really nothing accommodations-wise that met their expectations," McGowan says. So, The Study at Yale was born. In Philadelphia, Drexel University is leasing the newest Study's prime plot of land to Hospitality 3, giving the property its stamp of approval and helping promote it, and other institutions are likely to have similar Study affiliations. With a third location in the works at the University of Chicago, and talks in progress at other prominent universities, it appears McGowan may have bet right, with each new location offering a rich store of local color and tradition to draw on. "You can feel the personality and character of a campus immediately," he says. "And I get excited because I walk in and say, there's so much to work with."